As professional photographer, Joel Sackett's pictures have been featured in National Geographic, Time, and Business Week. However, despite his busy work schedule he has managed to also work on projects that are meaningful to him personally. While living in Japan during the 1990s, Sackett worked on several photographic documentaries about Japanese culture. 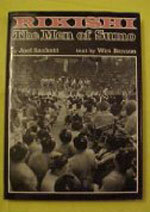 Rikishi: the Men of Sumo is one of Sackett's book from that time. Since moving to Bainbridge Island, Sackett has published two books about the community he now calls home: In Praise of Island Stewards (2002) and An Island In Time (2005). Both books feature extensive photographs about the places and people that makes this island special. The photos are accompanied by text and, in the case of An Island In Time, interviews by Candace Jagel. Former WA Secretary of State Ralph Munro says of Island Stewards: "Everyone who cares about preserving communities like Bainbridge needs to purchase this book." In recognition of Sackett's efforts on behalf of Bainbridge Island he was awarded the first ever Island Treasure Award , together with Jerry Elfendahl.